Burning embers of peat crackle within the luscious cherry infused custard as waves of complex medicinal and maritime notes add an earthy and vegetal saltiness (without the pungent beach theme) that is moderated by glazed candied stone fruit, light vanilla and the peppery bite of cured meat and the tang of Worcestershire sauce. 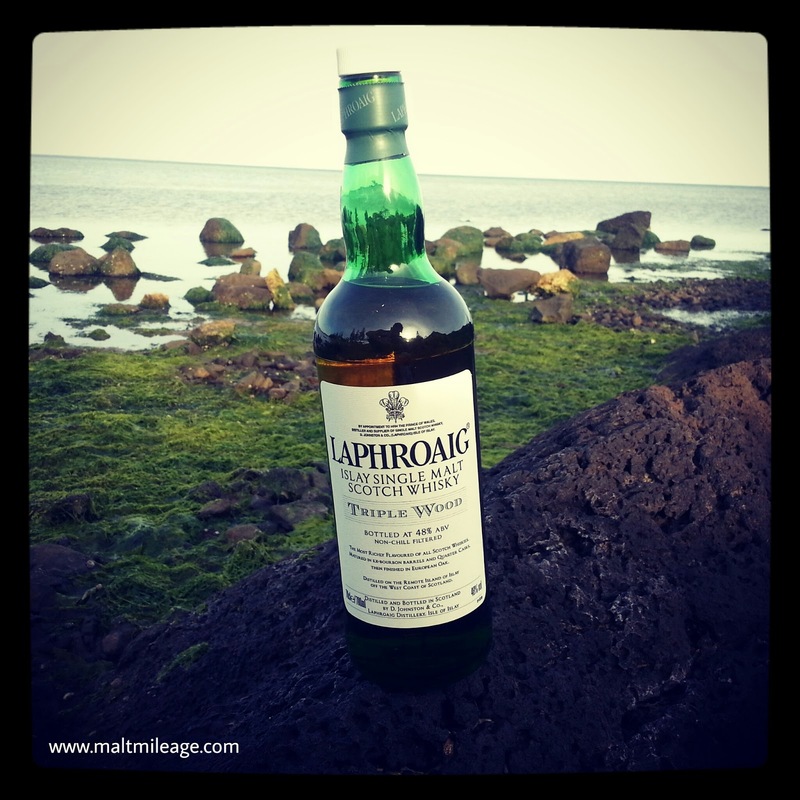 The Laphroaig Triple Wood rests in the glass, the winds are gentle and the character is at first unremarkable. Then the winds gather speed, and the character begins to swirl, unleashing one of the most complex whiskies I have tasted. Give this beauty a chance, unpack it carefully, and sip it slowly. The Laphroaig Triple Wood is prepared just like the standard Quarter Cask expression, but with a lovely twist: it is “finished” in sherry casks. It is called “triple wood” because the first maturation is in American oak ex-bourbon barrels, the second is in quarter casks (also American oak) and the third is in large European oak Oloroso sherry casks. 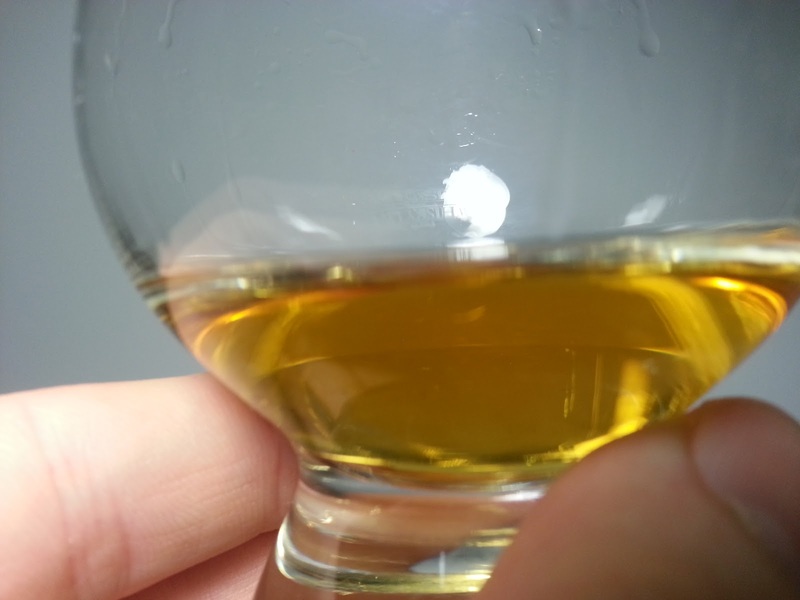 To read more about the benefits of quarter casks, please see my review on Laphroaig Quarter Cask. The Distillery Manager at Laphroaig explains a lot more about the Triple Wood in the below video. Nose: Possibly one of the most complex bouquets I have encountered in a whisky, the Laphroaig Triple Wood offers vanilla and American Oak that is smoothed and balanced by the sherry cask influence to create an immediate burst of aromatic cherry infused custard. The sherry cask and bourbon cask struggle for dominance, and in this respect it is more subdued than the Laphroaig Quarter Cask because there is no dominant surge of vanilla. This leaves me with quite a conundrum… which do I prefer? The Triple Wood is more complex than the Quarter Cask, with the spray of medicinal (betadine soaked cotton bandages) and maritime (the salty spray of the sea and rock salt notes, though no overly pungent beach theme) notes that bring a saltiness and brininess that acts as a counterweight to the sherry. Strangely, despite being finished in a sherry cask this whisky allows the typical maritime and ocean Islay notes to shine through the haze and fog of peat and oak. The Quarter Cask is more energetic than the Triple Wood, with a lovely rich explosion of American Oak and vanilla that enlivens the whisky. Each whisky therefore has its place, and both are spectacular in their own way. If I had to choose, I would lean towards the Triple Wood only because there seems to be lots to explore and unpack with that whisky including the maritime notes. The peat is rough yet elegant, pounding yet graceful. The sweet cherry becomes glazed, adding a sweetness as vanilla and caramel notes rise from the ashy peat with peppery chorizo or salumi and oysters. This is sensational whisky! Taste: Intense, oily and delicious. This whisky hits the palate with a surge of oak, as the sherry cask influence clearly takes a leading role. The crackling embers of peat burn on the palate with the sweet glazed and candied stone fruit, but the picante fire resembles the anise seed and spice (pepper, sweet paprika) infused home made salumi made in Neapolitan households around the world (possibly, hot chorizo may be similar, and this moves from the nose to the palate in spectacular form). There is a tang, almost like Worcestershire sauce (fitting, with the oyster theme and cured meat, you might get Oysters Kirkpatrick) but without the oyster and the slight hint of cardamon. That cardamon is interesting, but it also delivers hints of vegetation along the beach but without the beach or pungent maritime theme. Spectacularly complex. Finish: The peat and gooey red cherry jam coats the palate, radiating with the glow of woody chocolate and oak as the salty cured meat rests and slowly vanishes. After ten minutes a curious medicinal taste flickers like a dying torch, then dies. Complex notes with beautiful bourbon and sherry cask influence that do not hide the medicinal and maritime notes we love in Islay! The maritime notes are not intense, and do not bring the pungent beach theme. Mind blowing complexity. Give this a chance and be patient. This whisky may take a while to unpack. It does not strike the nose as quickly as the Quarter Cask for example.